Category Archives for "Piano lessons"
You always wanted to learn to play piano? This is your chance! 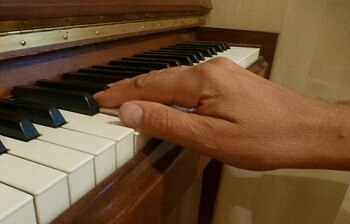 In this 10 step-tutorial you will learn the basics of piano playing and reading music and you will play your first song. Step 10: Play that song! If you want to learn to play piano, you need, well…a piano! When this seems obvious, it’s perhaps less obvious what kind of piano to choose (if you don’t already have one). The first question that may arise is: what is better, an acoustic piano or an electronic keyboard? In this context, it’s important to realize that a lot of electronic keyboards (especially the cheaper ones) don’t have a real ‘piano feeling’. What I mean is the following: in a piano, a hammer strikes one, two or three strings. The hammer is connected by a lever system to the key. 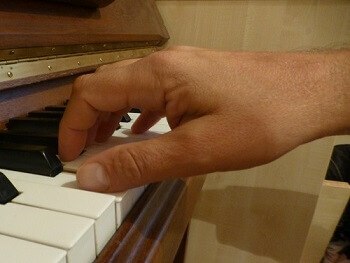 This causes a resistance when playing the key, and this is the ‘piano feeling’. To learn the piano, it’s not a good idea to buy an electronic keyboard that is not weighted, as it misses this feeling of a real piano. So, to conclude: to learn to play the piano, acquire either an acoustic piano, or an electronic keyboard that is at least semi-weighted, but better is a keyboard with hammer action. In my article “How to choose the best piano keyboard 2017 – Top 9 digital pianos” you can find much more information and tips for when you are looking for a suitable piano. When sitting in front of the piano, your arms should be horizontal (your elbow should be at the same height as the keyboard, or eventually a little bit higher). To achieve this, adjust the height of the bench. Your back should be straight. Place your knees slightly under the keyboard and keep your feet flat on the ground near or on the pedals. And, most important: relax! Relax your muscles, relax your body and your shoulders. Never hold your hand and fingers flat. Your hands and fingers should be curved as if you would hold a tennis ball. It is important to use the right finger positions in order to be able to link the consecutive notes in a melody nicely together. 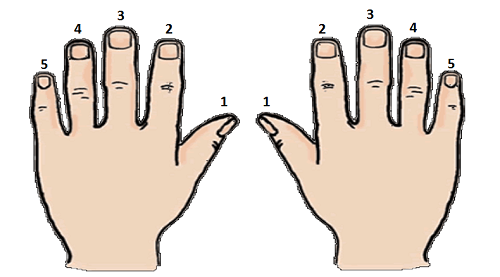 Both hands use the same finger numbering: the thumb is finger number 1, the index finger is number 2, the middle finger is number 3, the ring finger number 4 and the little finger is finger number 5. From now on, I will use only the finger numbers and not any more the finger names. So, I will not anymore say: “Play this key with the index finger”, but: “Play this key with finger number 2”. A good habit is to use the metronome when practicing the piano. With a metronome, you keep a steady rhythm without speeding up or slowing down the notes of the exercise. Start to put the metronome on a (very) slow tempo, for example 60 beats per minute. If this is still too quick, simply slow it down even more, till you master the exercise at that speed. Once mastered, speed it up: set the metronome on a higher tempo and redo the exercise. You master it at the higher tempo? Speed it up even more, till you master it at the wanted speed. A bad habit is to want to play a melody, a song, or an exercise directly at a high speed, because you will make mistakes. A lot of people start at a high speed and think that if they will play it again and again (at this high speed), they will master it at a certain moment. Don’t make this mistake: start slowly, and when you’re able to play it well, then speed things up. Another thing: in most songs, you can count 1-2-3-4 1-2-3-4 1-2-3-4 and so on. When doing your exercise, melody or song, first put the metronome on and count with the metronome 1-2-3-4 and then start to play on the next 1. When you look at a piano keyboard, you see black and white keys. When you look a bit closer, you can see that there is a pattern in the piano keys. You can see that the best by looking at the black keys: you will see groups of two black keys and groups of three black keys. Now look at a group of 2 black keys (it doesn’t matter which one). The white key at the left side of a group of 2 black keys is called the C. When you play a note on a C key, you hear the note C. You can see that there’s not only one C on the keyboard: every time you have a group of 2 black keys, the white key just at the left side is a C.
Let me go on by naming the other keys. Let’s have a look again at the C’s. Of all the C’s, there’s one C that we call the middle C. The middle C is typically the note that divides the piano keyboard in two parts: a lower part at the left side of the middle C and an upper part at the right side of the middle C.
Usually, you play the upper part with the right hand and the lower part with the left hand, although you can play notes lower than middle C with the right hand and notes higher than middle C with the left hand. For more information on the middle C, see the lesson “The middle C on a piano keyboard”. So we now know the names of all the white keys. What about the black keys? Well, we don’t need them for now. But if you are interested: in my lesson “The note names and how to find the notes on a piano keyboard”, you can find also the black key names and more information about note names. There is one staff for the right hand and one for the left hand. To indicate which one we’re dealing with, we put a symbol in the beginning of the staff: a treble clef for the right hand and a bass clef for the left hand. For now, we will only look at the treble clef. For more information, look at my lessons about the treble clef and about the bass clef. As mentioned before, the treble clef is for the right hand and is therefore meant for the higher notes. 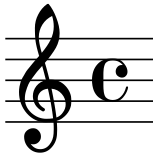 The higher notes are the notes from middle C and higher, although it is possible to use the treble clef also for notes lower than middle C.
Notes can be played short or long. Note lengths are measured in number of beats. A note can have a length of 1 beat, 2 beats, 3 beats, 4 beats, or also fractions of a beat. We call a note with a length of 1 beat a quarter note. In the next short video, you will see how to play this on the piano. For the finger positions, refer to the image above. You will hear the click of the metronome count to 4 before the melody starts. To train yourself in note lengths, you could do the exercise “Whole note, half note, quarter note”. The red arrows show each beat. You see there are 4 beats per measure. The half note, the first C, takes 2 beats. The 2 quarter notes, the E and the G, each 1 beat. And the whole note, the last C, takes 4 beats, the whole measure. And now you also understand why we call a whole note a whole note: since it fills exactly one whole measure. 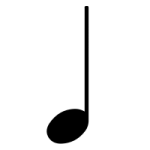 A half note fills half of a measure and a quarter note a quarter measure. 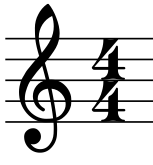 You can have up to 4 quarter notes in one measure. We call a song that has 4 quarter notes in a measure a song in 4 quarter time. As this is most common, we also call this common time. An example of music that is not in common time is a waltz. A waltz has 3 counts per measure. For more information about beats and measures, see the lesson “Measures (or bars) – Time signature”. OK, now you know how to locate the keys on the piano keyboard and how to read them in the staff, let’s start to play. I will show you how to play in the next video. I you prefer to read the exercise then just skip the video and keep on reading. It’s important to link the consecutive notes together so that you don’t hear a ‘gap’ between the notes. We will start on the middle C.
So, first play the note C with finger 1 (your thumb). Let it sound for about a second and then play the D with finger 2. Try to link the notes together so that you don’t hear a silence between both notes. On the other hand, you may not overlap the notes, so you may not hear two notes at the same time. This is not very difficult, but when you do it for the first time, you’ll have to practice that a few times. When you’re able to link the notes nicely together, play the note sequence in the staff of the next figure, so the notes: C D E F G. Place finger 1 (the thumb) on the C, finger 2 on D, finger 3 on E, finger 4 on F and finger 5 on G.
You can first try to play 1 or 2 times without the metronome. After that, put the metronome on a slow tempo (for example 60 beats per minute). Let the metronome count 4 beats, and then start to play the sequence. Every time you hear the click of the metronome, you move to the next note. When you finally play the last note (the G), let it sound during 4 beats (4 clicks of the metronome). When you master it well at 60 beats per minute (bpm), speed it up to, let’s say 70 bpm. Then 80 bpm, and so on. Another exercise would be to play the sequence as in the next figure, so the notes: C E G E C . For the C, use finger 1. For the E finger 3 and for the G finger 5 (as in the previous exercise). Again, do this with the metronome. Start slowly and then speed it up. A last exercise: play the sequence: C E D F E G F D C (see the next figure). Use again the same finger positions, so: 1 on C, 2 on D, 3 on E, 4 on F and 5 on G. As always, start slowly (60 bpm) and when you master it, speed it up. Let’s finally play our first real song! We will do “Twinkle twinkle little star”, since that song is not too difficult and everyone knows it. In the video below, I explain clearly how to play Twinkle twinkle. Notice that we will not have exactly the same finger positions as before. This is because we go from a G to an A. When you have your little finger (finger 5) on the G, as we did before, you’ll have to play also the A with the same finger. In this way, you cannot link the notes nicely together. So, in the first line of the song, you have to play the G with finger 4 instead of with finger 5. And that’s it; you played your first song on the piano! And I think you deserve a big applause for this! Are you interested in more? You can follow the free theory lessons and the exercises on this site. Are you interested in piano lessons? I have an online piano course with 14 hours of video, lots of play along files and with PDF files with scales and chords. You can have more information on the “Music courses”-page of this website. I hope you liked this piano lesson. Please let me know what you find of this article in the comments below.